Caladiums are tropical plants growing from tubers, most known for their colorful foliage, and used as a houseplant or summer bedding plant. It's a pity caladium are rarely thought of as houseplants. These plants are almost unparalleled for their foliage. They have large, arrow-shaped and paper-thin leaves that come in a striking array of colors and patterns. A mass of caladium is an explosion of whites, greens, reds and pinks ... mottled, veined and striped. But these plants have a few drawbacks. They are tuberous plants that only grow foliage from spring to autumn, they require very high humidity, and they have absolutely no cold tolerance. Nevertheless, as far as unusual indoor plants go, these are sure to raise a few admiring eyebrows. Light: Indirect light or moderate shade indoors. The narrower the leaves, the greater the sun it can withstand. Water: When leaves appear, keep evenly moist. Never allow to dry out and keep humidity as high as practical. Temperature: The warmer the better. Aim for 70º if possible—tubers begin to grow around 70ºF. Fertilizer: Fertilize weekly during the growing season with liquid or use slow-release pellets. Any garden with a shady location has a perfect spot for caladiums. These tropical tubers, most of them varieties derived from Caladium bicolor, are grown for their dramatic summer foliage. They are naturals in beds with ferns or coleus, in pots to accent shady spots, or used as indoor houseplants. Caladium bicolor is widely available at garden centers and nurseries. The leaf shape is oval or like an arrowhead. There are a multiple hybrids available offering a range of leaf colors and patterns. Tall varieties such as white 'Candidum' and pink 'Carolyn Whorton' put on a beautiful show, but since each tuber has only one to three active buds, the leaf count is low. Lance-leaved types, including 'Rosalie' and 'White Wing', produce many more leaves from multiple buds, but the leaves are thinner and not as long. Select a shady area that is moist, well drained, humus rich, and slightly acidic. Caladiums are popular grown around the bases of trees, but for this planting scheme to work, you will need to create a 5-inch-deep bed of rich soil so the tuberous roots will have adequate space and a fair chance at moisture. In the warm, humid climates of zones 8 and 9, plant caladium tubers directly into the ground in spring. In most other areas, you'll save several weeks of growing time by transplanting potted plants that are already up and growing. To make watering and fertilizing easier, consider planting three tubers (or plants) in 6-inch pots and sink the pots up to their rims in the beds. The pots collect and hold water, stave off invasions from thirsty tree roots, and make it simple to lift and collect the tubers in fall. 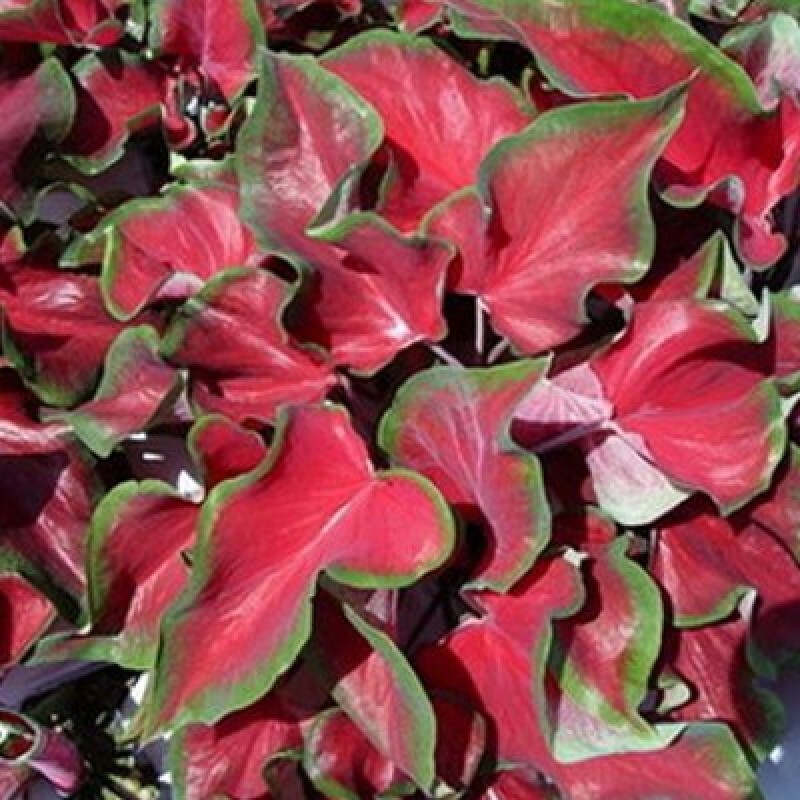 Because caladiums are basically all leaves, they thrive on regular fertilizer. To keep plenty of new leaves coming on, feed with a balanced soluble fertilizer such as 10-10-10 twice a month. The great advantage of pot-grown caladiums is that you can move them about as needed to keep them warm. When nights become chilly in fall, bring them indoors and keep in a sunny window, until the leaves begin to wither. At that point, let them dry out completely. To save space, you can collect the tubers, shake off the soil, and stash them in old hosiery or a mesh bag for up to five months. As long as the tubers are stored above 60d F, they will be ready to replant the following spring. planted can be 2 to 4 inches deep in well-draining soil. Soil should be moist before bloom and in late summer.